us & HGTV are bringin’ you the most epic GaRAGE SaLE showdown this side o’ the RiO GRANDE! 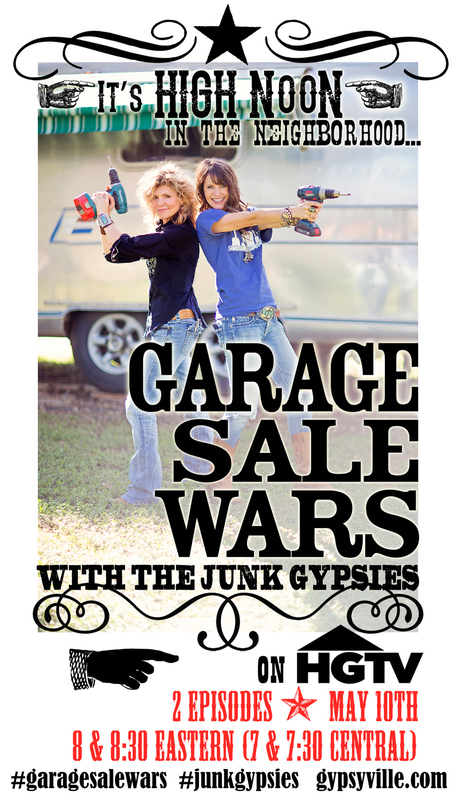 GaRAGE SALE WARS airs FRiDAY…MaY 10! AND GeT reaDY!!!! we’re having our FirST OFFiCiAL twitter partayyyyy with HGTV on 5/10 during the premiere! step into the TwiTTERverSE and geT tweetin’ y’all!!! & use those HAsHTAGS!!! this ain’t yo granny’s GarAGE saLE…this is WAR!!! because all’s FAiR in LovE & GaRAGE sALES! CLiCK below for a little SNEAK PEEK! and stay tuned for an HGTV/JG pinterest page coming soooooon!!! Hello, I’m writing to ask you for a suggestion. My friend Stephanie and I are huge fans. We even came to Warrington this year and Were lucky enough to meet you both and you took a picture with her daughter Bodie. Yesterday her daughter that is 15 asked me what to do for her this Mother’s Day. Then she asked what y’all would do! I thought it was so cute. Stephanie doesn’t ever want to celebrate Mother’s Day because a man ruined that day for her in the past. Bodie and I would like to get her back on track. Can you suggest a fabulous junk gypsy idea we could do for her? She is an amazing friend and single mom. Bodie has saved up $200. We would appreciate any suggestion! . Love the show!! Wish I loved closer to come down for the fun!! Northern Wisconsin is far away!! I wanted to sign up but can’t log on. Help!!! I have discovered you all while recovering from unexpected double surgery! I love you! Know I want to redo my garage into a workshop and do a little of what you do. You are inspiring! BTW Amie, you wore a rainbow circle vest on an a past episode that I just watched. This would be the perfect project while I am out of work. I can’t find a pattern like it anywhere. Do you happen to know where I can get it? Keep up the great work ladies, you make such a positive difference in the lives of others! PS- I already have the DVR set for Garage Wars! Can’t wait! Love your style……it’s so fun……love you guys…….love it love it love it…….! Hi, I am a Huge fan of both of your shows Junk Gypsies and Garage Sale Wars. I was just wondering where y’all get your clothes from. I love all of your jackets and outfits y’all put together, and wear on t v.
I was also wondering if Garage Sale Wars is going to be on once a week , because after I watched the first two on May 10th, I saw that It didn’t come on the next week. thanks sooo much for watching the shows and for digging our threads! most of our jackets and vests are vintage/goodwill items! 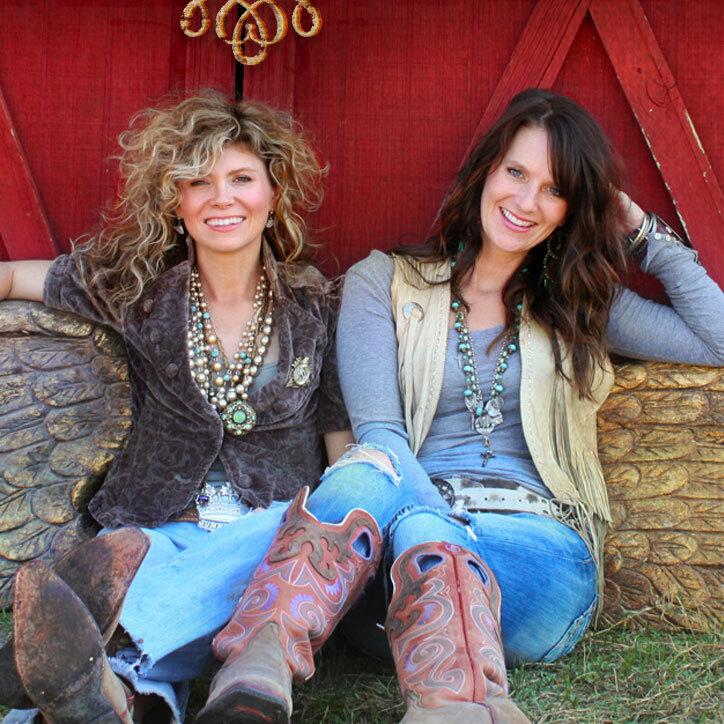 our tees are typically junk gypsy tees…the jewelery is a combination of jg jewelry and vintage/fleamarket items! garage sale wars is re-airing this week. we don’t know yet if it will become a series or not…but we promise to keep y’all posted!!! XOXOXXOX! Thank goodness for reruns!!!! I saw garage wars, it rocked! Just me;) I have never been able to get a response to any of my questions regarding products ?????? Should I look some where else???? So sorry you haven’t gotten a response!! IF you have ANY questions regarding products..please give us a call… 979.249.5865 we will be more than happy to help ya out!! 🙂 You can also send us an email at junkgypsy@gypsyville.com THanks so muCH!!! XoXO!! maybe you have this posted and I can’t find it. Is Junk Gypsies on HGTV anywhere now. We miss you!!! Thanks for your inspiring shows. I too need a Garage Sale War! Just tell me how, where and when! LOL I live in Texas and I go to Round Top/Warrenton about once a year. I ALWAYS come to the JG booth. This year I am bringing my sister, 3 nieces and a friend. See u soon!